Thanks to Paleo Diet and Fitness - one of our #YHLbloggers - we have another Your Healthy Living inspired recipe for you try. 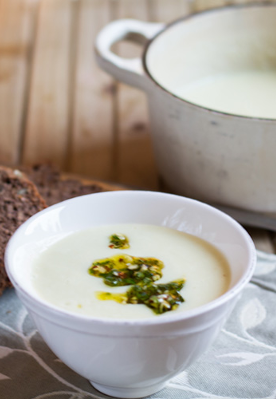 A creamy and soothing soup packed full of flavour with a delicious pesto dressing to add texture and crunch. It is perfect for January, being light and delicate and will be gentle on the stomach after the over indulgences of the Christmas season. 1. Heat the oil in a saucepan over a medium heat and add the onion with a pinch of salt. 2. Cook gently for a minute or so, without browning the onion, and then add the cauliflower. 3. Cover, and steam for about 10 minutes making sure that the ingredients do not brown. 4. Add the bay leaf and the turmeric. 5. Pour in the almond milk (or stock if using) and simmer gently for a further 10 minutes or until the cauliflower is tender soft. 6. Check your seasoning; a teaspoon of mustard and plenty of freshly ground pepper can be good here. Blitz to a smooth puree. 7. Mix the ingredients for the pesto together and swirl into the hot soup.